HP recommends this 4-server configuration for larger solutions where high-availability is a requirement, the expected user population is up to 1000 users (assuming an active user concurrency of typically 25-50%), and usage of various SharePoint Application services (for example Excel Services, PerformancePoint, etc.) is planned. The expected solution workload is mostly collaboration and portal activity, with some use of team sites and My Sites, but also includes extended use of the various new SharePoint 2010 application services (for example, Excel services, Office client services, and others). SharePoint 2010 has extended the possible topologies for the Search service by enabling more than one Index Search service to be run on separate servers. This feature can be used to provide redundancy for the service (high availability), or to divide the crawl sources across multiple services, thus improving overall crawl speed, and to apply differing crawl rules and frequencies to better match the business need regarding freshness of specific index data. 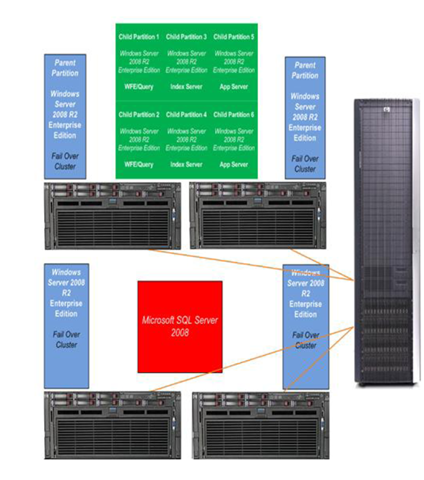 This configuration example utilizes two HP ProLiant DL585 G7 servers that are configured with four 12-core processors, 64GB of RAM, and eight internal SAS disk drives each, and are connected to an HP 4400 Enterprise Virtual Array (EVA4400) storage device to provide failover cluster support for 6 Hyper-V R2 virtual machines (VMs). Each VM is configured with 4 virtual CPUs, 8GBs of RAM, and a 40GB VHD container file that is hosted on a single 500GB LUN configured as a Cluster Shared Volume provided by the EVA4400 device. In this 6 VM example the WFE and Query roles, Index Service role and Application services role are each deployed on two VMs. In this case, it is to provide increased capacity, as the high-availability needs are already met by Hyper-V R2 running on an active/active failover cluster. Further, the solution is sized such that each physical server is running at no more that 50% of maximum recommended capacity. Thus should failover occur, the remaining server can support the total VM load and not impact performance. SQL Server is installed into a separate active/passive cluster of an additional two HP ProLiant DL585 G7 servers, each have four 12-core processors, 64GB of RAM, and storage for the SQL databases is provided via the same EVA4400 SAN.